Bank overdraft fees can pile up rapidly, making it increasingly more difficult for a consumer to get back to zero, which is why Congresswoman Carolyn Maloney of New York recently introduced legislation aimed at limiting how much and how frequently banks can ding account holders for these fees. 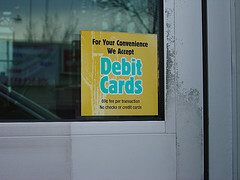 The Overdraft Protection Act would cap the frequency of overdraft fees and one per month, up to six per year, and would require that these fees be “reasonable and proportional” to the amount an account has been overdrafted, as consumers often complain about being hit with a $35 fee for overdrafting only a few cents. The act would also stop banks from charging a fee if the overdraft results from a hold placed on an account that exceeds the amount of the transaction. We’ve heard of several instances, especially at gas stations, where a merchant automatically puts a 3-figure hold on a customer’s debit card, regardless of how much they intend to spend at the pump. Perhaps most importantly, the act would stop the practice of processing transactions in an order that is most likely to maximize overdraft fees. Say, for example, that a customer has $99 in his account and there are four pending purchases, one for $100 and three for $33 each. If all these purchases are processed, the customer is going to overdraft regardless. But if the bank processed the three $33 purchases and then the $100 item, the customer is only charged a single overdraft fee. But if the bank processes the $100 charge first, each of those $33 purchases will likely be hit with a separate fee. So even though the customer has spent the same amount of money, the bank has made significantly more for itself by processing the more expensive purchase first. Meanwhile, the American Bankers Association says such legislation is unnecessary. “History has shown that when the government intervenes in how private markets price their services, there are unintended consequences that usually are adverse to consumers,” said Nessa Feddis, senior counsel at the ABA. Of course, given the influence of banks on the lawmaking process, and the general difficulty any new legislation has of being enacted, this bill has a snowball’s chance in Hades of getting out of committee… but it’s good to see people try anyway.